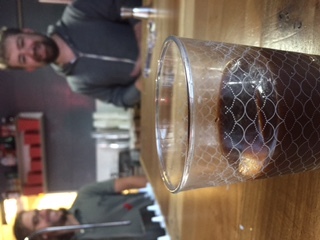 Herman’s Coffee in South Philly is holding their official “Grand Opening” Celebration. 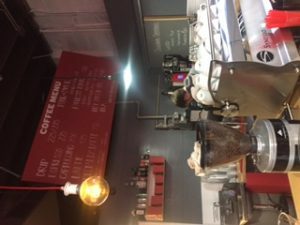 If you are into coffee, you need to check this place out. Mat Falco, best known as the editor of Philly Beer Scene Magazine, opened Herman’s because of his love for the coffee bean. I stopped in recently to check it out. It’s a nice size space with plenty of seats and plugs for charging devices (or posting about what you are drinking!). 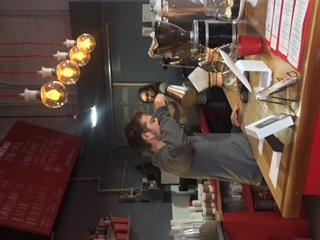 Herman’s has everything from regular drip coffee to “Pour-overs” – I enjoyed a pour over of an Ethiopian roast, which had a blueberry flavor. Mat also served me one of Herman’s specialty drinks – an espresso cocktail. Two shots of espresso served cold in a highball glass, with a housemade pumpkin spice flavor and an orange peel garnish was a fantastic treat. Herman’s will be roasting their beans on site soon – so stop in and see what’s new in the Philly Bean Scene! Any time I get the opportunity to travel, I try to experience as much of the local beer scene as possible. Earlier this year I had a long weekend in the Seattle-Tacoma area that was pretty amazing, both in the number of breweries I visited and in the quality of beer I tasted. Part of what made this trip so special was that I had two local tour guides that took me to places that I would’ve normally just said “nope, that’s too far away from my hotel” or “I haven’t seen much about that on social media.” So special thanks to my friends – my mythical companion #jimantush, and Bri, who showed me more about the Seattle – Tacoma region breweries than I would have discovered on my own! The reason for the trip to Buckley was a visit to the local brewery, Elk Head Brewing. 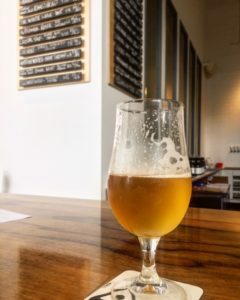 I had tried a well-traveled crowler of their beer earlier in the year (brought to Ft. Lauderdale by Bri, then brought to Philly by me, and sampled at my home in the burbs!) and I was excited to see the source! 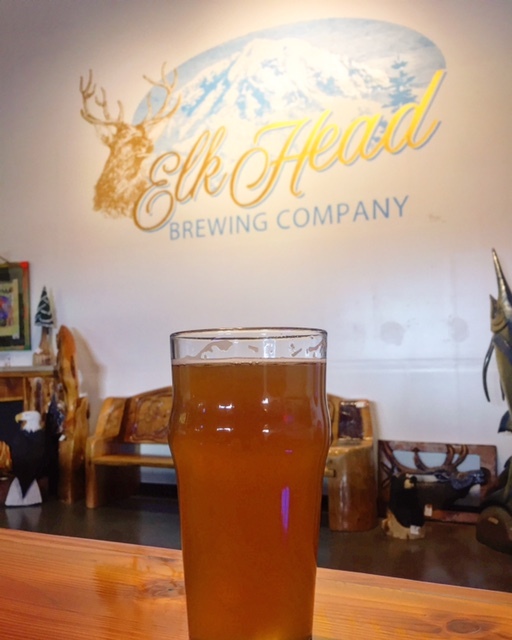 Elk Head is located in a small industrial park, similar to many breweries these days. 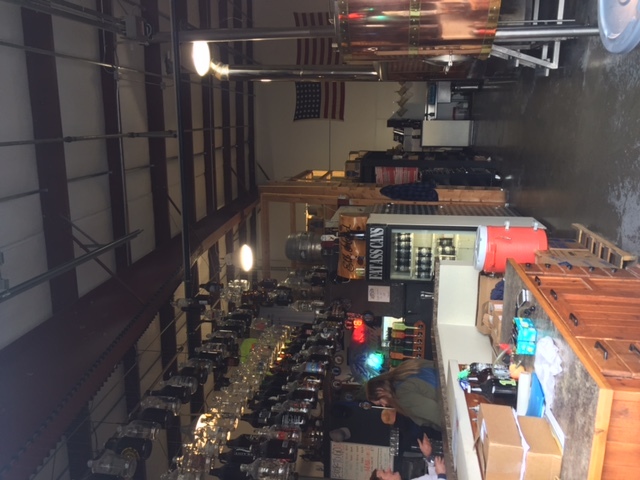 But three things stood out – the all copper brewing equipment, the distinctly non-hipster clientele at the bar, and the welcoming owner-bartender Al pouring the taps. It was clear as soon as we walked in that this was the local pub; the group of beer drinkers at the bar had obviously just finished work and were there to drink a beer for happy hour – enjoying each other’s company, and giving me sideways looks that seemed to say, “Who’s this guy? 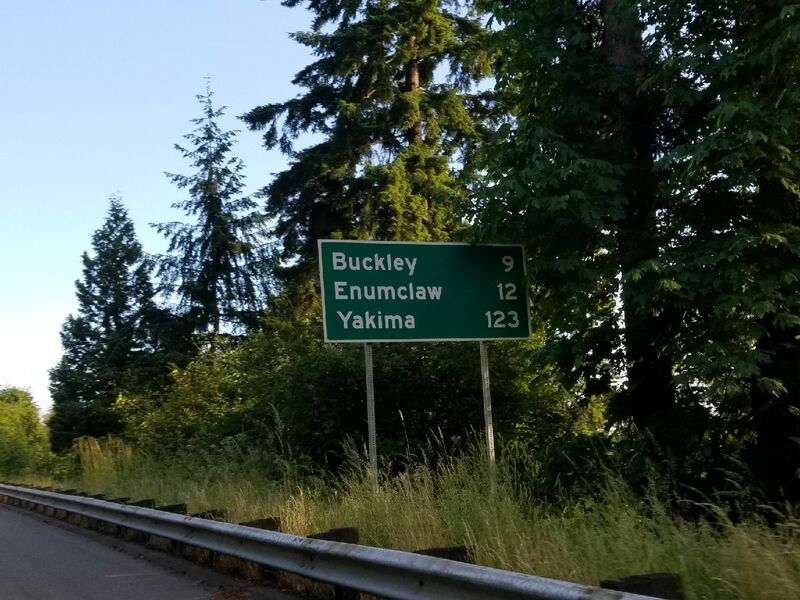 He’s not from Buckley.” Most notably, these gentlemen had no handlebar mustaches and were not checking their beers into Untappd. 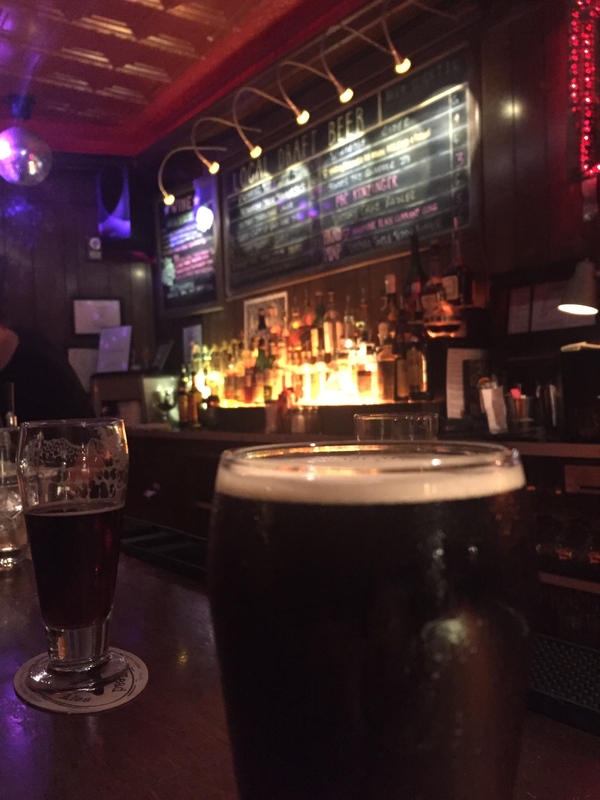 Once I ordered my beer – a jalapeño infused brown Ale called “Blast Zone” – I asked Al how long they had been open and how much they distribute. To my surprise he said they have been open for 14 years, and they primarily serve on site. 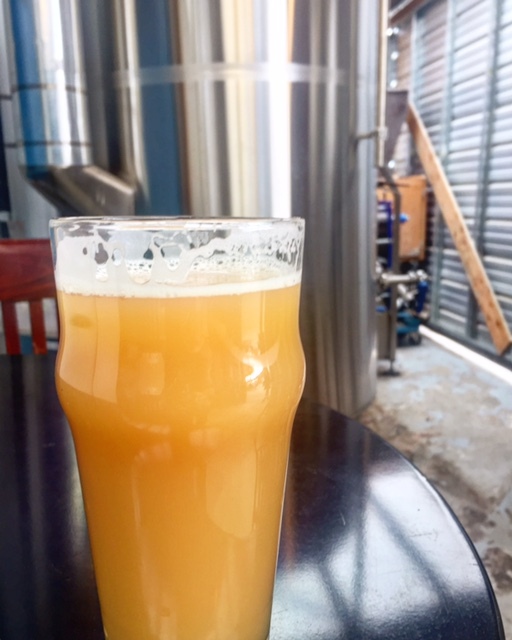 I could ramble on about how I believe that Elk Head Brewing is the model (and the future) of the sustainability of the craft beer industry, but there are many more beers to discuss in this article. 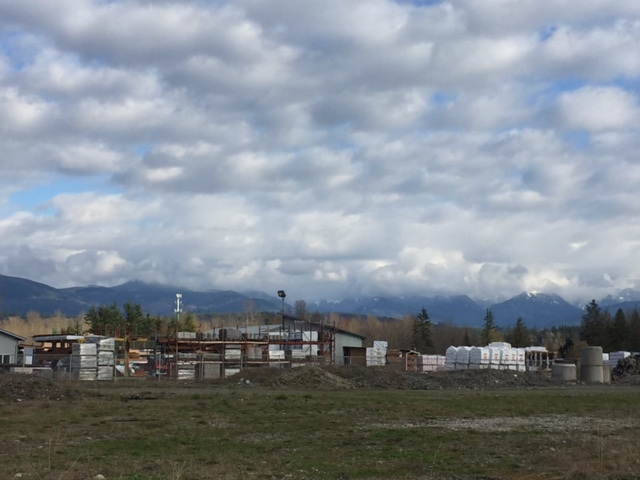 As we walked out the door of Elk Head, I was again stunned by the vision of the mountains in the distance, and kept wondering how I could squeeze a trip in to visit the famous hop fields on the other side someday. 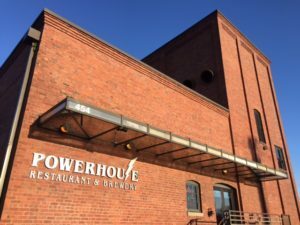 Our next stop was in the town of Payallup, but before my lips touched any beer, I was required to learn how to pronounce the town name properly – “pew-all-up.” With that out of the way, we went to Powerhouse Restaurant & Brewery. Operating in an old power station located next to the regional railroad, the brews were solid, especially the “More Power!” DIPA, with my favorite being the “Up Plum Kriek” sour ale. 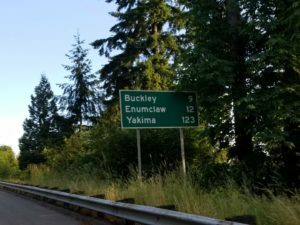 After dinner, we visited Tacoma and a few of the breweries there. Dystopian State Brewing Company is located in a space that previously housed an old car dealership and overlooks Commencement Bay. 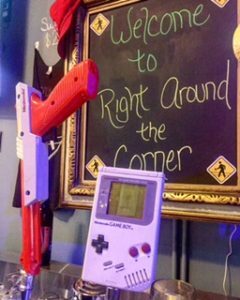 With a large space for live music and a long bar, I enjoyed their “Everyone’s Crisis” cream Ale as well as their post-apocalyptic branding. 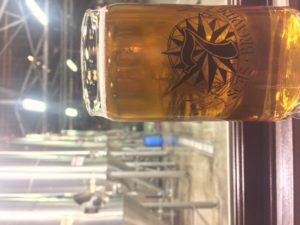 The next stop was 7 Seas Brewing Company, a modern brewery in an old brewery space. 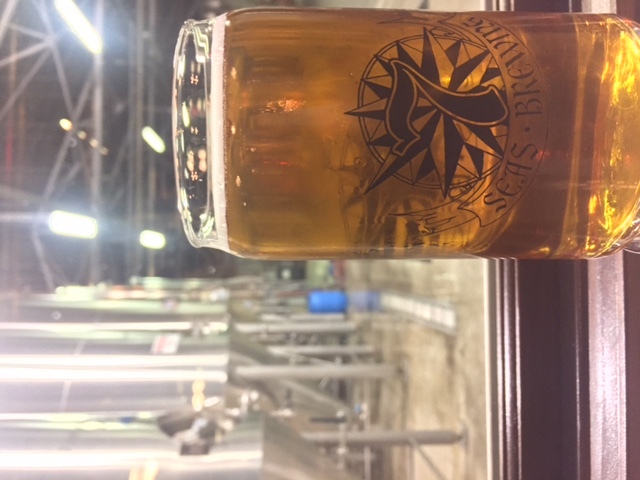 7 Seas brews in the building formerly occupied by historic brewery Heidelberg Brewing Company, which had its heyday in the mid 1900s. The large space still evokes impressions of a time when lager was king and the country needed lots of it! 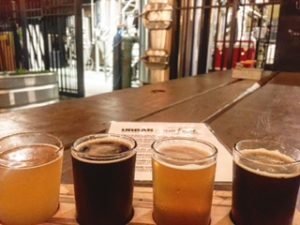 It holds a large tasting room offering 7 Seas’ year-round brews, seasonals, and a constantly rotating Tap Room Reserve Series. 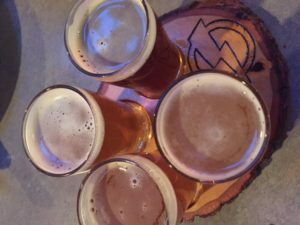 My favorite 7 Seas brew was their “Chinook Single Hop IPA,” but that should not come as a surprise to those who know me because of my affinity for Chinook hops! 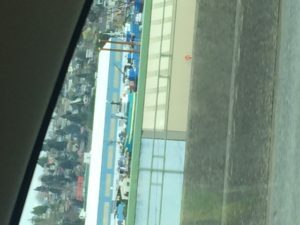 (Pro tip – I was corrected by the locals that the proper way to say “Chinook” is “shin” not “chin”). 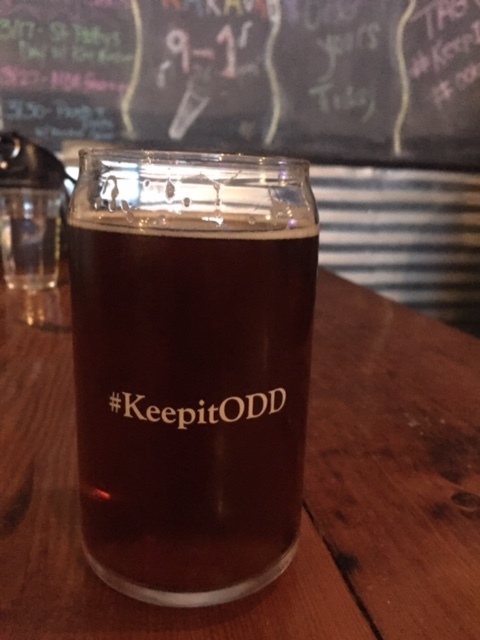 Our last stop of the evening in Tacoma was Odd Otter Brewing. Prior to arriving, it was recommended to me to try their “Ottermelon Watermelon Ale,” but unfortunately it wasn’t available. Instead, I sampled their Brown Ale which was a very malty, enjoyable beer to drink as we laughed at the late night karaoke devolving in the back room. 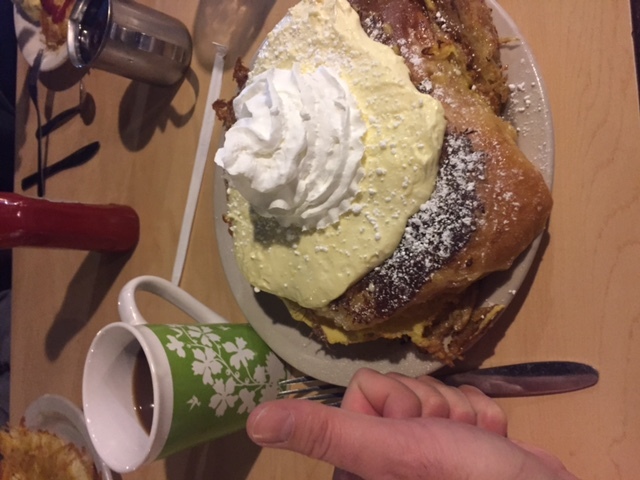 Sometimes a massive cinnamon roll and coffee is just what you need to start another beer tour day! 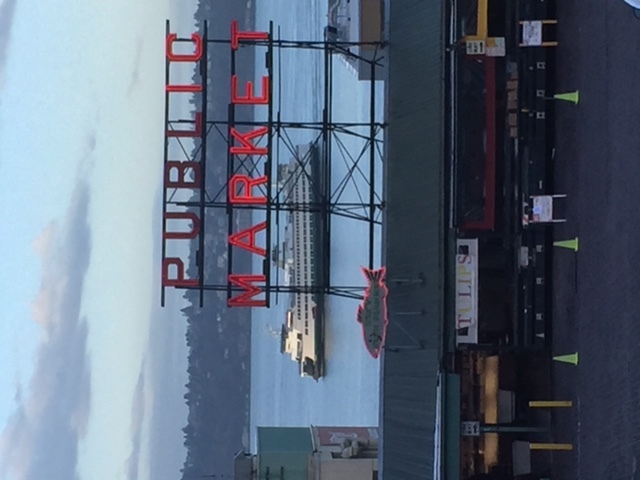 The next day we made our way north from Tacoma into Seattle. 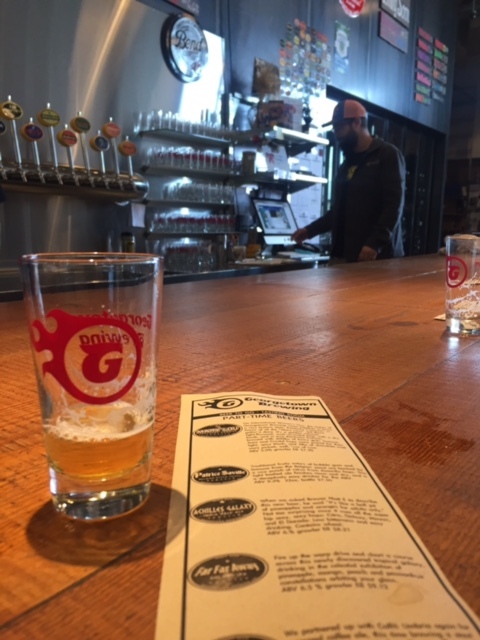 Our first stop was in Seattle’s southern district of Georgetown at the aptly named “Georgetown Brewing Company.” Opened in 2002, Georgetown Brewing Company was the largest draft-only beer production company in the country until this summer. 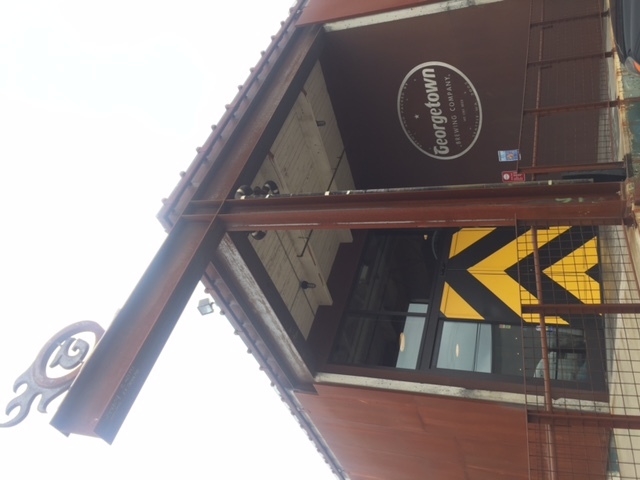 For 15 years Georgetown only sold kegs and growlers – according to our server in their large tasting room, Georgetown filled over 100,000 growlers in 2016. 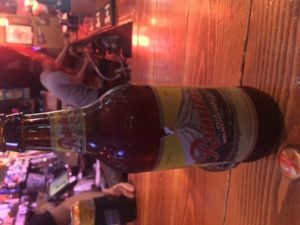 Their flagship beer – “Manny’s Pale Ale” – can be found on many taps in Seattle; they sold over 50,000 barrels of “Manny’s” in 2016. 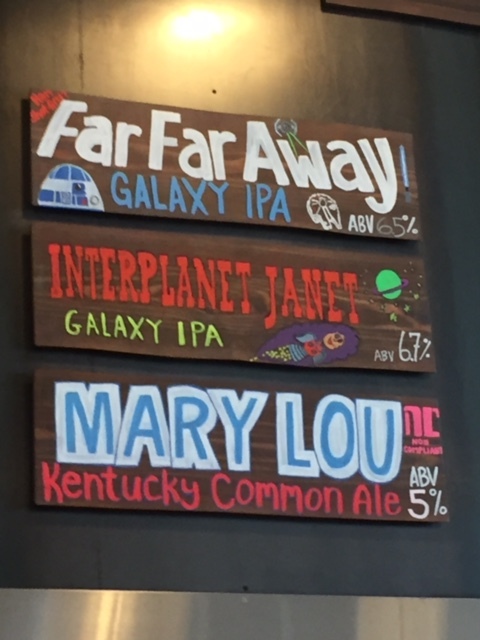 In May of this year, they began canning Manny’s, so their “largest draft only” title is no longer applicable. 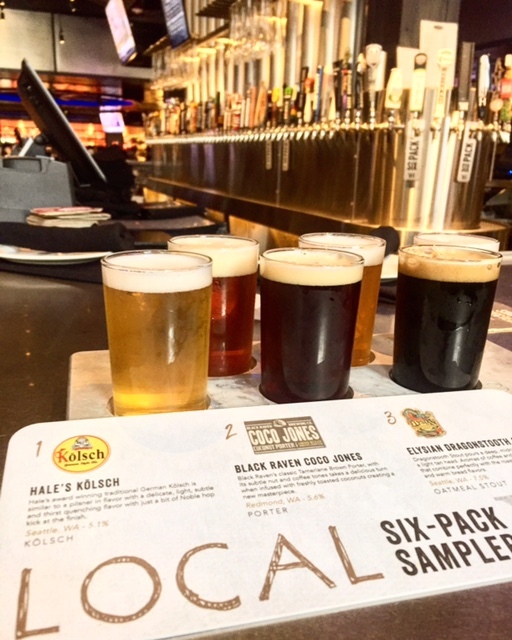 In the tasting room, 7 or 8 samples are usually available from an extremely friendly and knowledgeable staff, and if you like one of the samples, you can purchase a prepoured growler of it. 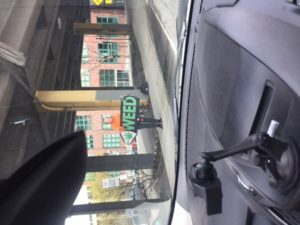 Here’s something we don’t see in Pennsylvania! After Georgetown, we made our way into downtown Seattle to experience Holy Mountain Brewing Company. 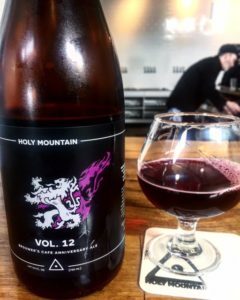 Holy Mountain Brewing – a great surprise! 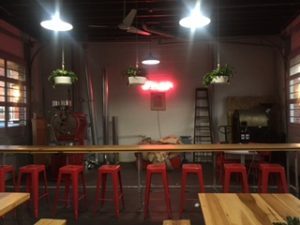 Walking into the unassuming grey warehouse, I expected the interior to be a dark, industrial design with maybe some neon lights, like so many other warehouse breweries today. But similar to entering a shabby tent in the desert and finding it a luxurious palace, as I entered Holy Mountain Brewing, it took me a second to process what I was seeing. White subway tile on the walls was illuminated by significant amounts of sunlight, and high ceilings gave the impression that you had stepped into a beer oasis. 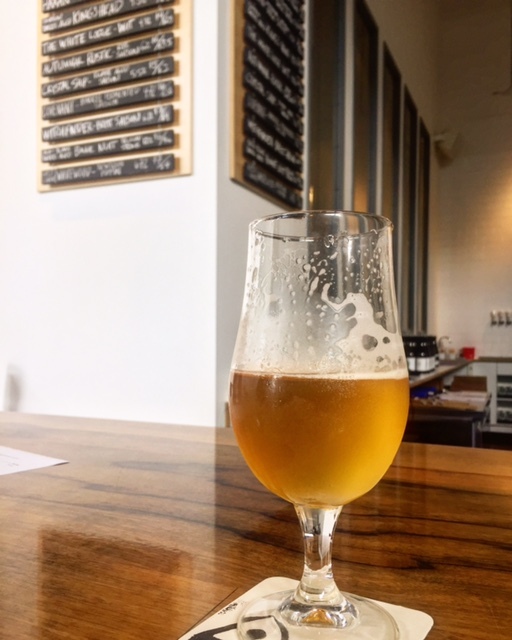 Having never heard of Holy Mountain before this trip, I was surprised again – the first beer on the draft list was “Satan is Real” pilsner, a collaboration with our own local brewery Tired Hands! After I tried the collaboration (and commented in irony, “Really? I come to Seattle and end up drinking a local Philly beer?”), my companions and I split a bottle of Holy Mountain’s “Volume 12” an amazing sour Ale brewed with black raspberries to celebrate the 12th anniversary of craft beer bar “Brouwer’s Cafe” in the Fremont section of Seattle. 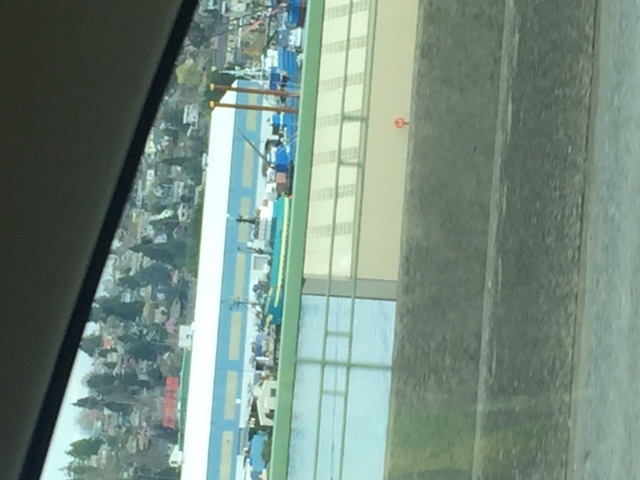 Next, we continued traveling north to the Ballard section of town, and as we crossed the Ballard Bridge, there was another exciting moment – as I surveyed the massive crowd of fishing boats in the harbor and saw the ship the “Cornelia Marie” from Discovery Channel’s “Deadliest Catch” fame. 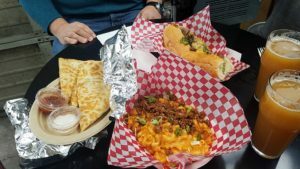 Once we arrived in Ballard, we visited Reuben’s Brews. I ordered a flight and took a seat at a picnic table in the warm spring sun. After trying a pilsner and a barrel aged breakfast stout, their “Mosaic Crush IPA” had the perfect aroma and flavor to earn its name. As much as I hate the phrase, it truly was “crushable” in the Seattle sunlight. 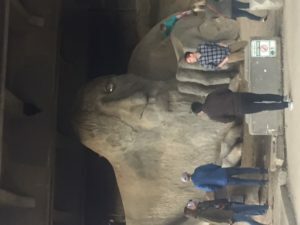 After Reuben’s Brews, we traveled to the Fremont district and took in the Fremont Troll, a giant troll statute under the Fremont Bridge and a must see if you go to Seattle. While in Fremont, I made a brief visit to Outlander Brewing, which, similar to Forest & Main, operates in a renovated early 1900’s home. I enjoyed a quick brown ale, then made my way next door to “Woodsky’s” bar, where I had Seattle’s own “Rainier Pale Ale”, on the recommendation of a fantastic, handlebar mustache-sporting bartender who told me a great story about his visit to Philadelphia and tailgating before a Union game. 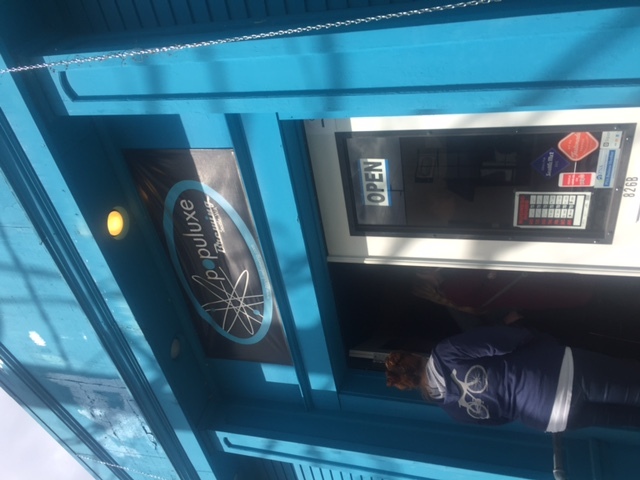 My last stop of the trip was Populuxe Brewing, also in the Ballard section of town. 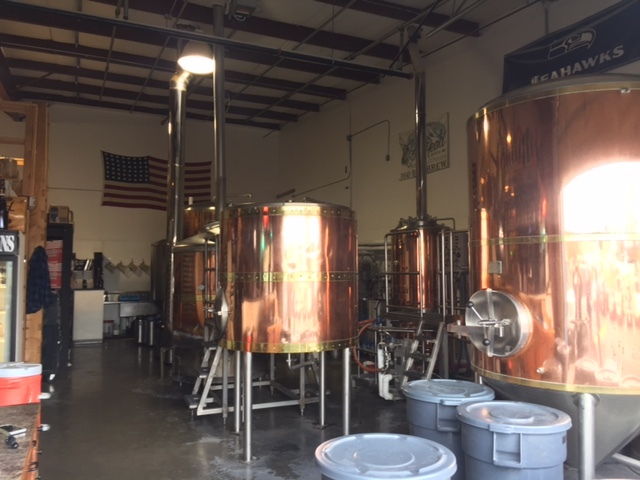 At the time, Populuxe was operating out of their original nanobrewery space that consisted of a tap station in the front and a beer garden in the back. 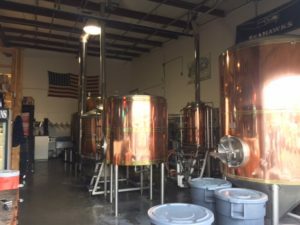 In September of 2017 they expanded their space and the main brewery is now located next door. 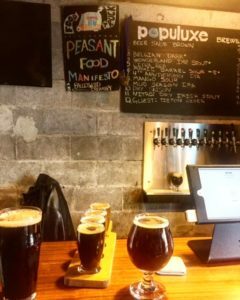 Populuxe was one of the few breweries that I visited in Seattle that not only served a NE style IPA, but nailed it! In fact, one of my tour guides had never heard of the style before, but was so enamored with Populuxe’s version that she now seeks them out and emails me links to the tap releases! Populuxe’s “4th Anniversary IPA” had an amazing tropical fruit and citrus aroma and looked like pulpy grapefruit juice. It was excellent! 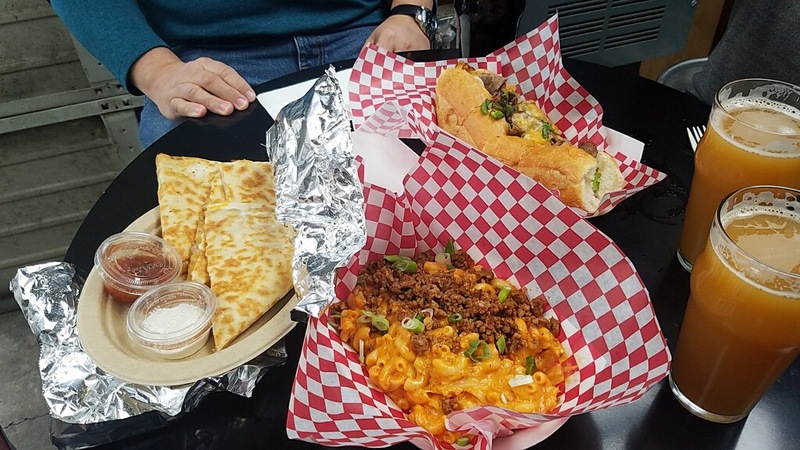 To enhance their beer, Populuxe features food trucks, and the one that was there during our visit served Mac and cheese with chorizo and Kim chi, as well as a “Vietnamese style” cheesesteak. All in all, Populuxe was a perfect last stop and is on my list to re-visit when I go back. 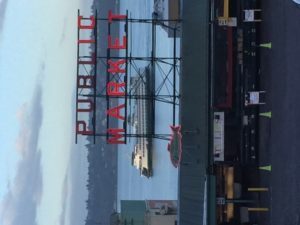 In the end, Seattle is known nationally for large brands like Red Hook, Ten Barrel and Elysian. 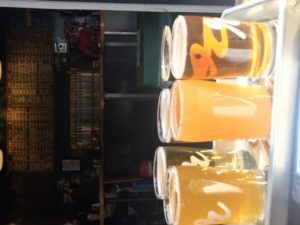 But with a little bit of research – and some tips from locals – you’ll find some exquisite jewels of craft breweries. Photo courtesy Keystone Homebrew Supply. When I’m not drinking beer or writing about beer or dreaming about beer, I try brewing beer. But let’s be clear: extract only (One of these days I’ll find the extra time to brew all grain). At last count I’ve brewed 18 five gallon batches over the past 4 years (I’m not counting the two I brewed sometime in 1995/1996), with only 3 that were pretty much undrinkable – and those 3 failures were the result of simple process mistakes. Not too bad of a ratio for an amateur – but it’s the small mistakes that kill your beer, and paying attention to detail is extremely important. I have to note – every single one of those Brewing kits have come from Keystone Homebrew Supply in Montgomeryville (even the 2 in 1995 & 1996, when they were located in a tiny little shop on Route 309)! I was reminded of the importance of attention to detail in brewing the other day when I stopped in to Keystone Homebrew Supply in Montgomeryville to pick up my next kit. Usually I run in, get my prepackaged kit, grab the hops and yeast out of the fridge myself (because I can’t help myself – I usually tinker with the recipes), pay and leave. But the other day was different – I needed help because my favorite kit (called “Emperor Pale Patine”) wasn’t on the shelf. But at each step in the recipe he asked “Do you do this?” Or “How do you do this step?” As Alan asked me these seemingly innocuous questions, he pointed out a few things that I could do (or not do!) to make my beer better. And those few simple things made so much sense that it blew my mind. 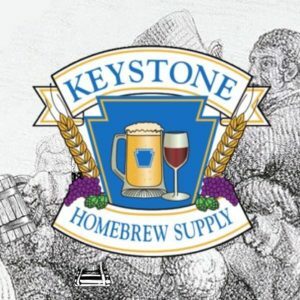 I’ve always heard that about Keystone homebrew Supply – in fact, they announce in their email newsletters – “If you have questions, feel free to ask anyone.” But I am usually on the run and don’t ask. So I’m glad Alan took the time to ask ME the questions! I’m stoked to try this next kit and just wanted to thank Alan and the Keystone staff! And PS – if you are a Forest & Main fan, Keystone sells a kit of their “My Analog Brain,” an English bitter. 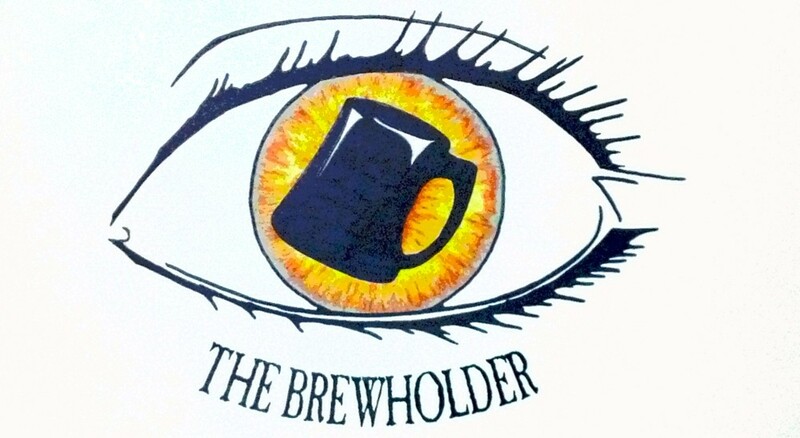 That’s definitely on my list to brew – maybe it will be my 20th batch! 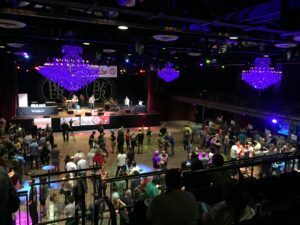 I just realized that I never posted my review of Yards 10th Annual Real Ale Invitational. In sum, I had a blast and can’t wait for it again next year! Read my review on Philly Beer Scene Online Exclusives. 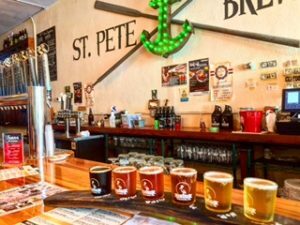 First stop – St. Pete’s Brewing! Recently I found myself on what was supposed to be a four day trip to St. Petersburg, Florida. 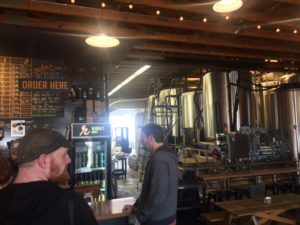 Not knowing much of the beer scene there, I did some Googling prior to arriving (and consulted my fellow beer explorer #jimantush) and found several names of breweries – so I was encouraged. whipping by on what is usually a commercial city street for commuting mini-vans! 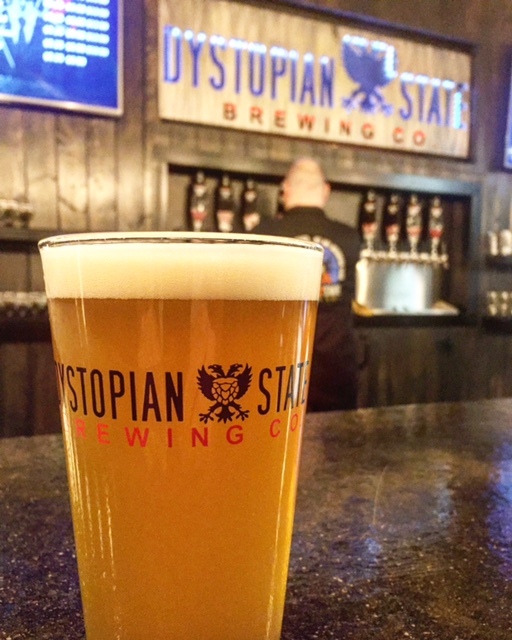 With my brewery list in hand, I set out for the city’s namesake, St. Petersburg Brewery. According to my bartender, St. Pete’s Brewery was one of the first five breweries to open when the law changed to allow for breweries in 2013. (The other 4 were: Cycle Brewing Company, 3 Daughters, Green Bench, and Brewers Tasting Room). 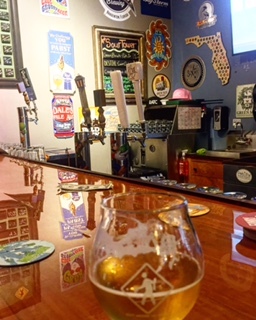 After getting some tips from locals at St. Pete’s bar, I went to Cycle Brewing which is only a block away. For as bright and tropical as St. Pete’s was, Cycle was dark and industrial, with bikes hanging from the ceiling at the back of the bar. 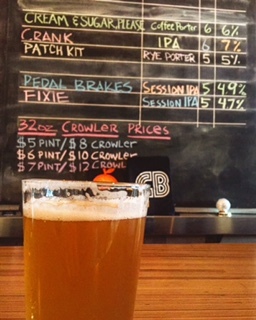 Two session IPAs were pouring; I tried the “Pedal Brakes” and listened to the punk music thumping on the stereo. Although I did not try it at the brewery, later in the evening I had the chance to drink Cycle Brewing’s “Cream and Sugar, Please Coffee Porter.” The flavor of coffee was perfect and made me wonder if I could take some to my hotel for breakfast the next day! The next stop – highly recommended by the folks at St. Pete’s – was Green Bench Brewing. 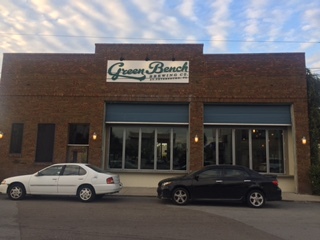 Green Bench is known in the area for their saisons and sours, so it was an absolute must visit. 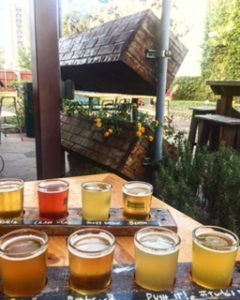 I enjoyed two flights in the lovely beer garden on the side of the brewery; it was an idyllic scene as I sampled their beer and watched the sky turn from orange to blue to indigo. I enjoyed Green Bench’s Saison de Banc Vert – a saison / table beer, as well as their Cranberry Vert. Once the sun set and the sample glasses were empty, I set off for Urban Comfort Restaurant and Brewery, which was added to my list on the recommendation of a local beer drinker I met earlier in the day, who raved about their comfort food. 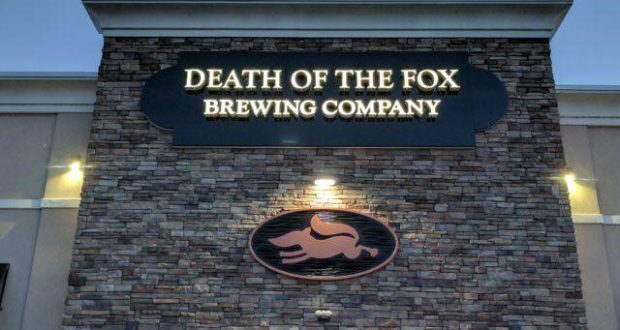 What struck me the most as I arrived was the fact that the brewhouse was outdoors – under a roof of course, but outdoors nonetheless; which would never be seen in the harsher climate of my home state of Pennsylvania. 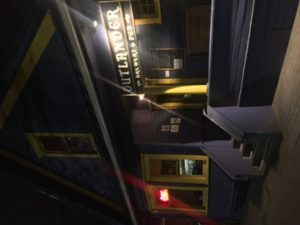 I ordered a flight of four brews and asked for one of the most comfortable meals in existence – meat loaf and mashed potatoes – but they had already sold out. So I chose the braised pulled pork on mashed potatoes with fried pickle chips, which had a surprising spicy kick to it. Once the flight was gone, it was time to head back to the hotel and make a plan for the next night. But first – on another recommendation by a local – I stopped into Right Around The Corner Bar. 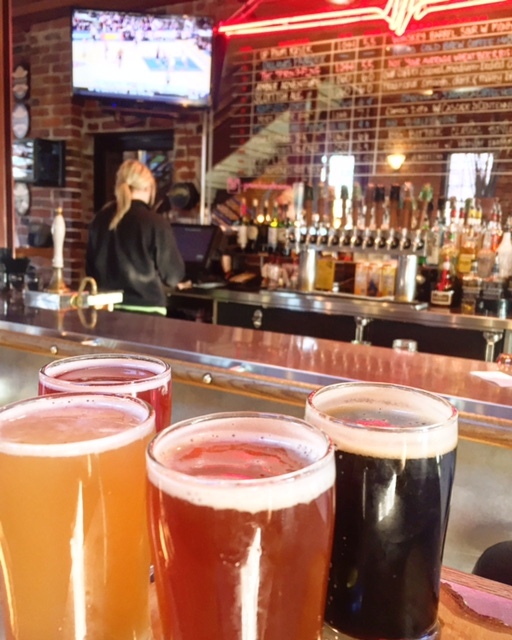 Known for its selection of sour beers, Right Around the Corner Bar is owned and operated by Tom Rockhill, a passionate craft beer fan. As I sipped a quick nightcap, Tom pointed out his “Sour Tower” list (3 taps that always have sour beer) and the main draft list on the wall. I was surprised to see a brew from Weyerbacher and asked Tom how a Pennsylvania brew had gotten to his bar! He explained that Weyerbacher had participated in the St. Petersburg beer fest the prior week, so there were a lot of unique brews in town! At last call, Tom suggested I return the next night so that we could talk more about the St. Petersburg and Tampa Beer Scene, and I enthusiastically agreed. Unfortunately, when I awoke the next morning, the news from Philadelphia was bad – snowmageddon was approaching, and the Eagles had acquired Nick Foles again. I reluctantly moved my flight and returned to Philadelphia, and promised myself (and Tom) to return to St. Petersburg again soon to finish what I had started! Cheers to everyone I met from the St. Petersburg beer scene – thank you for your hospitality and hosting a wonderful beer day! 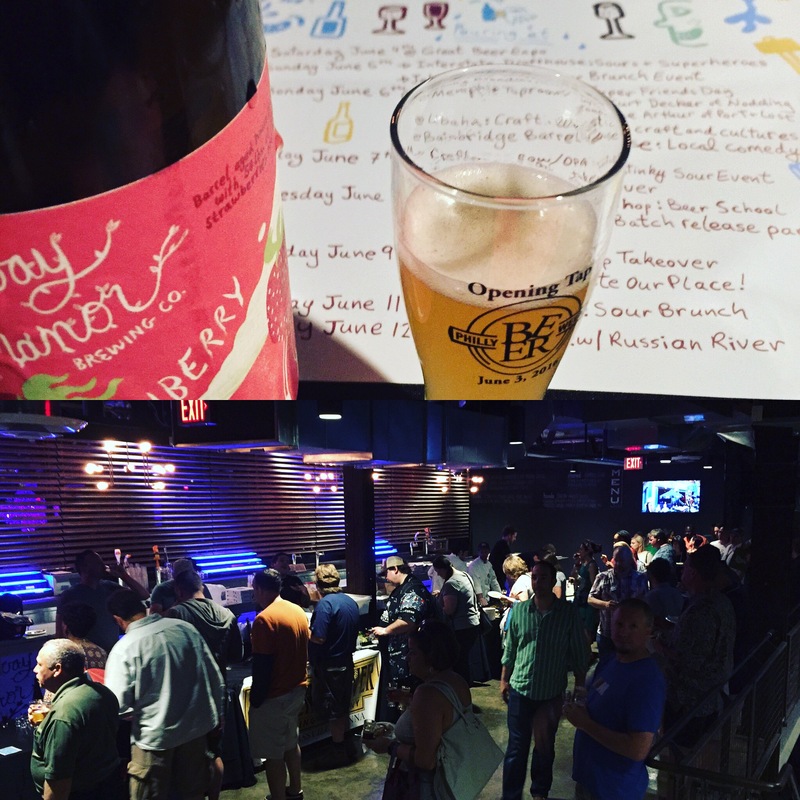 Philly Beer Week 2016 is here!! 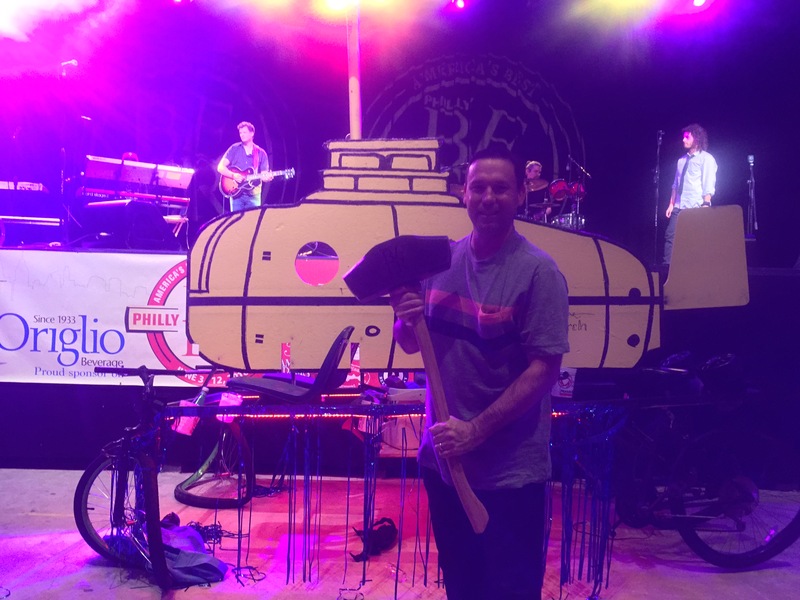 Once again the City of Brotherly Love is showing its love for brew to the World! On Friday, June 3, 2016, the official opening of Philly Beer Week 2016 began at the Fillmore in Fishtown, with a beer festival / celebration of all things beer – The Opening Tap! Anxiously awaiting the arrival of the HOG to open to first keg of PBW! 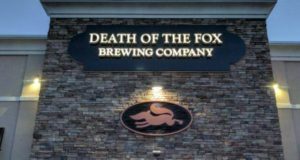 For those holding VIP tickets, the doors opened at 6pm – all the breweries on the main floor were giving out their samples, while some newcomers – Brewery ARS, Hidden River, Highway Manor, and Death of the Fox – delighted with their tasty brews upstairs. VIP session with Highway Manor’s excellent strawberry and blueberry sours. As it neared 7:00pm, anticipation began to rise for the arrival of the Hammer of Glory (The HOG), the sledgehammer used to crack open the first keg of Philly Beer Week – that had begun its Olympic-torch like journey from bar to bar since 8am. 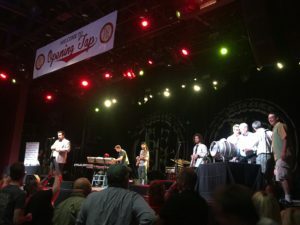 Once it arrived, Joe Ortlieb, 91 years young, used the HOG to get the Brotherly Suds 7 flowing – “Ryebock Lager,” a collaboration beer between “The Big 7” Philly brewers – Sly Fox, Yards, Victory, Iron Hill, Flying Fish, Stoudts and Troegs. The view from the mezzanine of the beautiful Fillmore. 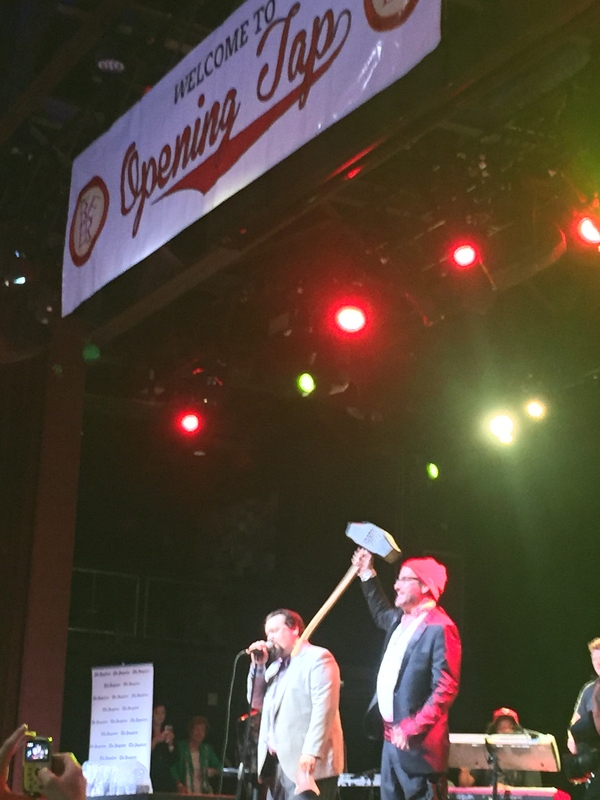 Casey Parker and Will Reed welcome the HOG to the stage! 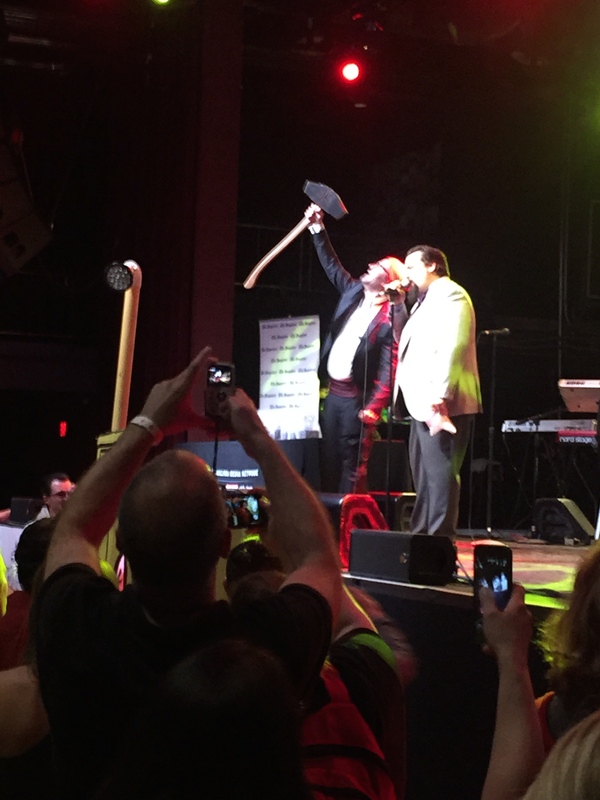 Check out my Facebook page and Instagram for videos of the tapping of the keg and Joe Ortlieb’s toast! 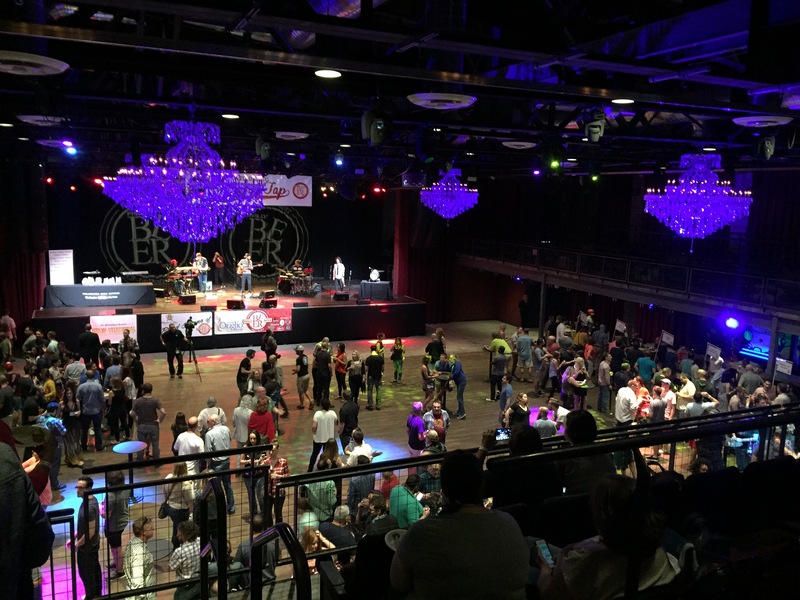 Once the beer was flowing, the beer festival began – and so did Philly Beer Week! Here’s a few more photos as the celebration continued! As Joe said in his toast – “Good beer, good friends, GOOD TIMES!” – that’s what Philly Beer Week is all about! Hope to see you out there! On this night you can call me The Hogholder. Will Reed of The Standard Tap brings the HOG to the stage! A Victory Yakima Glory at Johnny Brenda’s was a perfect end to the first night of Philly Beer Week! 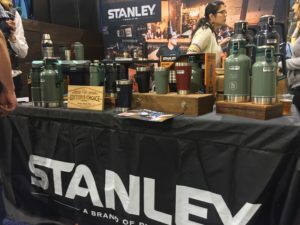 When I was at the Craft Brewers Conference this month, I visited the Stanley Products booth at the Brew Expo to check out the Stanley Growler. 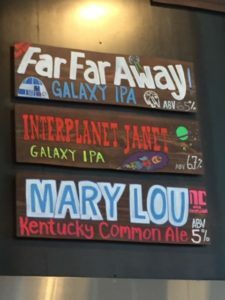 I had only heard about them for the first time in February – a friend had one filled with Oskar Blues Ten Fidy – and I was impressed! If you haven’t heard about the Stanley Growler yet, here’s the deal: a stainless steel, double wall, vacuum insulated body, this growler is advertised to keep beer cold for 16 hours! 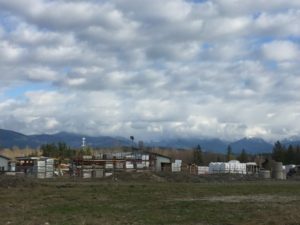 When I was drinking the Ten Fidy – an imperial stout – in February, I wasn’t too concerned about the coldness. But now in the summer months – and my affinity for pilsners and saisons at picnics and outdoor events – keeping them cold is paramount! So I acquired two full sized Stanley growlers (as well as a lidless Stanley tumbler that is advertised to keep beer cold for 4 hours), and over the next few weeks I’m going to put them to the test! Follow me – #thebrewholderstanleytest – on Instagram, Facebook and Twitter to see how the Stanley Growler stacks up! Last weekend I visited my friends at the Philadelphia Zoo during the Summer Ale Fest. 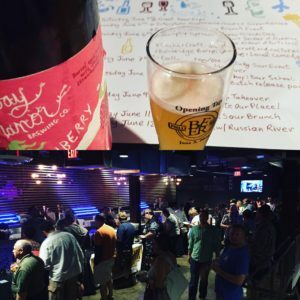 Read my recap on Philly Beer Scene’s Online Exclusives! Tonight I attended a media event at Victory Brewing Company’s new brewpub in Kennett Square. Victory President and Brewmaster Bill Covaleski was on hand to introduce the new brewpub and guide us through an amazing food and beer pairing. In addition to the samples of beer we tried, we each left with a bottle of Moving Parts 03 and the highly anticipated Summer Love Ale in a can. The summer is truly on its way! 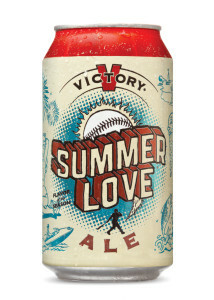 Victory’s Summer Love Ale now portable in a can! 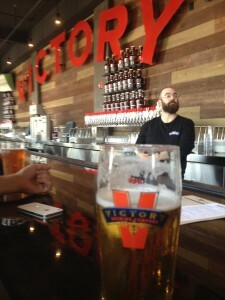 Photo courtesy of Victory Brewing Company.